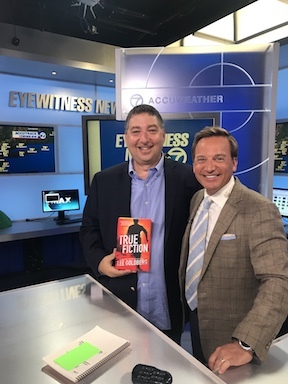 For years, I’ve been getting emails, tweets, and posts meant for Lee Goldberg, the WABC weatherman, and for Lee Goldberg, also a novelist, both of whom happen to live in New York, where Thrillerfest was held this past weekend and I was booked to be a panelist. So while I was at the conference, I decided to sneak away to finally meet my doppelgangers. Valerie and I looked at each other in horror. Do we look that old? Weatherman Lee bounded out to meet us, full of good cheer, and brought us back to the Eyewitness News set, where we took some photos and had a nice chat about the surprising parallels in our lives (for example my father Alan was the anchorman on Eyewitness News on KPIX in San Francisco). Weatherman Lee introduced us to the afternoon anchor David Navarro… and then he asked me if I’d like to join him on-camera to be a guest on his live “on the street” weather report. Of course I said yes. You can see the Facebook Live version here. It was a lot of fun. 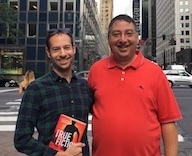 These two Lee Goldbergs write thrillers. One of them wrote TRUE FICTION. The next morning I met up with Novelist Lee, author of The Mentor, for breakfast. It turns out we also had some interesting parallels in our lives. For example. were both published by the Thomas Dunne imprint at St. Martin’s Press (they originally published my novels My Gun Has Bullets and Beyond the Beyond). We had a great time sharing stories about our experiences in publishing and in Hollywood. Now I’ve got to meet Lee Goldberg, the TV sportscaster in Maine, and Lee Goldberg, the technology writer…and maybe we Lee Goldbergs can figure out why there are so many Lee Goldbergs in publishing and television.